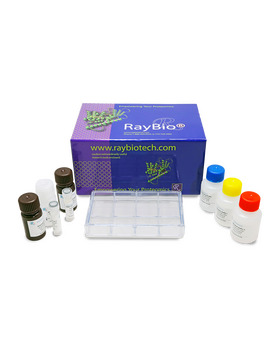 RayBio® C-Series Human EGFR Phosphorylation Antibody Array 1 Kit. Detects 17 site specific and pan Human EGFRs. 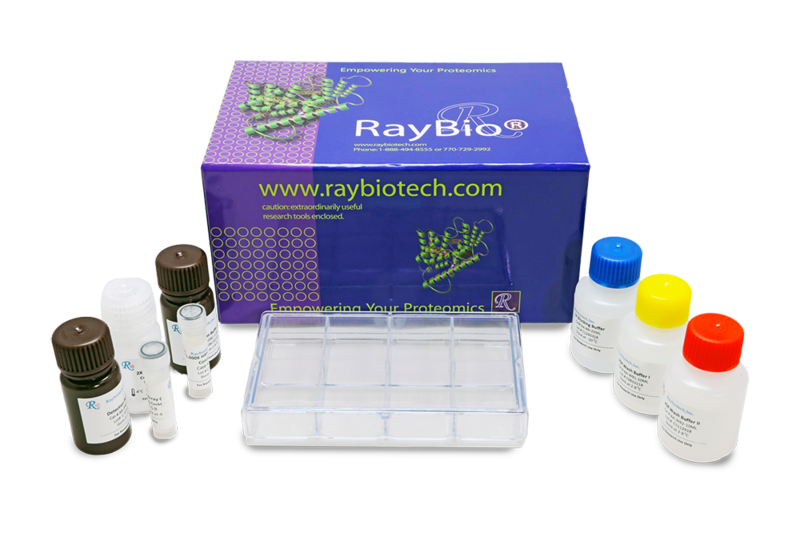 Suitable for all liquid sample types but intended for use with cell and tissue lysates. Wang X., Zhang M., Ping F., et al. Identification and therapeutic intervention of coactivated anaplastic lymphoma kinase, fibroblast growth factor receptor 2, and ephrin type-A receptor 5 kinases in hepatocellular carcinoma. Hepatology. 2018 Jan 21. doi: 10.1002/hep.29792. Tang Q., Wang Y., Ma L., et al. Peiminine serves as an adriamycin chemosensitizer in gastric cancer by modulating the EGFR/FAK pathway. Oncol Rep. 2018 Mar;39(3):1299-1305. doi: 10.3892/or.2018.6184. Asif M., Shafaei A., Abdul Majid A., et al. Mesua ferrea stem bark extract induces apoptosis and inhibits metastasis in human colorectal carcinoma HCT 116 cells, through modulation of multiple cell signalling pathways. Chin J Nat Med. 2017 Jul;15(7):505-514. doi: 10.1016/S1875-5364(17)30076-6. Mohan N., Shen Y., Endo Y., et al. Trastuzumab, but Not Pertuzumab, Dysregulates HER2 Signaling to Mediate Inhibition of Autophagy and Increase in Reactive Oxygen Species Production in Human Cardiomyocytes. Mol Cancer Ther. 2016 Jun;15(6):1321-31. doi: 10.1158/1535-7163.MCT-15-0741. Rios-Doria J., Sabol D., Chesebrough J., et al. A Monoclonal Antibody to ADAM17 Inhibits Tumor Growth by Inhibiting EGFR and Non-EGFR-Mediated Pathways. Mol Cancer Ther. 2015 Jul;14(7):1637-49. doi: 10.1158/1535-7163.MCT-14-1040. Montermini L., Meehan B., Farnier D., et al. Inhibition of oncogenic epidermal growth factor receptor kinase triggers release of exosome-like extracellular vesicles and impacts their phosphoprotein and DNA content. J Biol Chem. 2015 Oct 2;290(40):24534-46. doi: 10.1074/jbc.M115.679217. 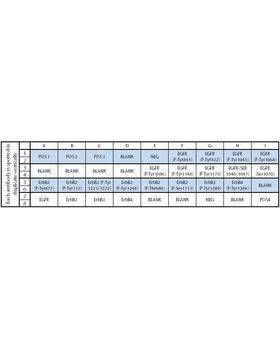 I used this array to test the cell lysates from epidermoid carcinoma cell line exposed to EGF, it works well.